Sorry, we are SOLD OUT of chicken until 2017! We are expanding our farm greatly this year by adding delicious Alberta lamb to the product list! We will have a small selection of lambs for sale, boxed and frozen. The size and weight of the lamb packages is yet to be determined, but they are growing great, and we expect to have some available by September. We will be introducing free range chicken again in 2017, as well as a small selection of free range turkeys. Three things make our chickens very unique, and very valuable. 1. The flavor - Our birds will take a full 11 weeks to reach a reasonable weight for eating. During that time, they feast on the things that chickens have been eating since Creation, insects, plants, and wild seeds. Because of this, they have far more flavor and dark meat, but will all the plumpness you expect from regular chicken. 2. 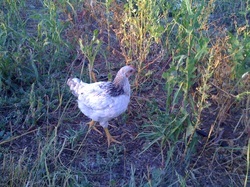 Health benefits - Chickens will eat what they need, if they can get it. Our birds are completely free range, and roam our land eating whatever they like. Studies have shown that animals fed on their natural wild feeds will have a much better balance of Omega 3/6/9 oils, and your body needs a proper balance of those nutrients. Regular chicken is vaccinated, and fed medicated feed for almost their whole lives. Our chickens do not eat any medicated feed, at any point in their lives. Because they have so much more space, they are unlikely to contract disease. 3. More Humane - Google "chicken barn", and you will find video of chickens living in some pretty ghetto conditions. This is normal for the conventional industry, and allows them to grow 20,000 chickens per year in a very small space at low cost. The chickens must be vaccinated, medicated, and in some cases, their beak will be cut down to prevent cannibalism. None of our chickens are de-beaked, and I have never had problems.